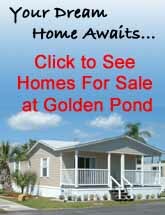 Click on the buttons below to see all that Golden Pond Village has to offer! Rent a cottage at Golden Pond Village for a low rate! Golden Pond Village offers a quiet Florida escape from the worries of life. Live in our all-adult 55+ community surrounded by large oaks with hanging moss and serene horse farms. We are located less than a mile from access to the Florida Greenway, a system of trails for hiking, biking, and horseback riding. Our location is also convenient via a scenic road to shopping, dining, and medical services in the town of Belleview (just south of Ocala). Join friendly neighbors in numerous social events such as bingo, karaoke, theme events, shuffleboard, and more at our clubhouses. 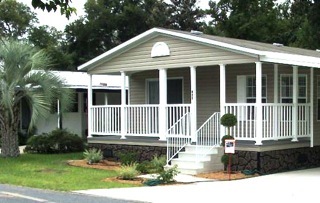 Whether you are looking to buy, rent, or park your RV, Golden Pond Village is the place for you! This website makes no guarantees based on presented information. Actual terms and conditions may vary. Call for further details and specific information. For technical concerns contact webmaster@villageflorida.com. For information on leasing contact info@goldenpondvillage.com. Photos, logos, and information all the property of Florida Village LLC.